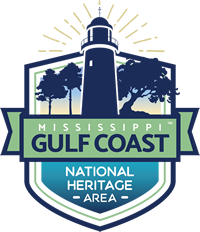 Biloxi’s three century history is the story of many and culturally diverse peoples. Archaeological artifacts and evidence prove the existence of prehistoric and historic Native Americans on the Biloxi peninsula long before European settlement. The name Biloxi, which means First People, is the legacy of the historic tribe that greeted the first French expedition in February 1699. Biloxi operated as the capital of the Louisiana Territory from 1720 to 1722, when it moved to New Orleans. Biloxi remained a French outpost until 1727. This resulted in a Biloxi-New Orleans connection that has never been severed. French occupation ended in 1763. With high hopes of permanent conquest, the countries of Britain (1763-1783), Spain (1783-1810), and the Republic of West Florida (1810-1811) hoisted their flags over Biloxi and the Mississippi Coast, which was attached to the Mississippi Territory in 1812. The Territory entered statehood in 1917. But, it was the French who left the most lingering influence in Biloxi. French records show that African Americans were among the small group of settlers at Biloxi in 1723. The early 19th century resort era began as steamboats brought yellow fever refugees from New Orleans and the surrounding areas. Many built hotels and summer homes along the beachfront, and some chose to stay. By the turn of the 20th century, tourists or “snowbirds” had begun to escape the rigorous winters from the North and the Midwest by coming to Biloxi. By the 1920s, Biloxi had become an all seasons resort, and numbers of the transients choose to make Biloxi their permanent home. The 1888 establishment of the seafood industry made Biloxi the seafood capital of the world in 1904. The industry brought workers who originally hailed from Croatia, Poland and the Acadian French from Louisiana. The new prosperity attracted Italian, Irish, French, Jewish, Lebanese, Greek, and German people who came from New Orleans and other areas. Mainly tradespeople, they established restaurants and other businesses on the beachfront and downtown. By 1920 the seafood industry and tourism were the drivers of Biloxi’s economy. The establishment of Keesler Field (currently Keesler Air Force Base) in 1941 brought military personnel from all over the country. During the aftermath of WWII, the Korean War, and the Vietnamese War, some members of the military brought their European and Asian wives to Biloxi. This added to the city’s ethnicity, as many of the military found Biloxi, with its beauty and hospitably, a great place for retirement. In the late 1970s, Vietnamese refugees found their niche in Biloxi and added their foods and customs to the city’s cultural mix. The city of Biloxi occupies a low-lying sandy peninsula that is part of a geological region known as the Coastal Pine Meadows. The peninsula is bordered on three sides by the bay of Biloxi on the north and the east and on the south by a lagoon known as the Mississippi Sound. The eastern tip of the Peninsula is known as Point Cadet. Melting ice sheets at the close of the Pleistocene Epoch ten thousand years ago created the modern topography of the area. Melt water flooded the deep canyons cut by the Tchoutacabouffa and Biloxi river system creating an estuary known today as Biloxi bay. Simultaneously, the low grasslands south of the peninsula flooded and formed the Mississippi Sound. Wave action formed offshore islands which buffer the coastline. These protected waters abound with the sea life that in the early 20th century made Biloxi the seafood capital of the world. Climatically, Biloxi and the Mississippi Coast is subject to an extraordinary seasonal temperature fluctuation. The humid subtropical climate can drive temperatures up to and in excess of 100 degrees and often produces convectional thunderstorms and sometimes hurricanes. But, Biloxi is located at the end of an open air shaft between the Appalachians and the Rockies down which cold fronts and sometimes Alberta Clippers may be jet streamed to sometimes bring temperatures to below freezing. Currently, Biloxi’s customs, foods, festivals, languages, street names, and architectural styles offer a glimpse into its past. Despite the ravishes of three centuries of hurricanes, Biloxi is still a place of great beauty. On August 29, 2005, Hurricane Katrina robbed Biloxi of some of its historical landmarks, many of its grand oak trees, and even whole neighborhoods, but a great deal of the city’s historical sites and architecture remains to be discovered and enjoyed. The driving tour is divided into an east and west route. Both routes begin at the Biloxi Visitors Center. Each will take approximately two hours to complete. Spend the day discovering Biloxi and all it has to offer.